The US is enjoying its sixth year of recovery following the Great Recession, but against a sluggish global backdrop there are signs that the US is also becoming a two-speed economy. A buoyant labour market and low inflation should ensure that household spending remains firm and continues to underpin a solid expansion into 2016. But the more externally-exposed industrial sector is facing headwinds from a stronger dollar and weakening emerging market demand, with lower global oil prices hitting investment in the energy sector. Together these factors are expected to peg back growth to 2.6% in 2016. Economic forecasting is not easy at the best of times, but is especially difficult at the moment. Six years on from the financial crisis, the global economy is still struggling to regain momentum, and there is little consensus over the causes of this prolonged weakness. In one camp are economists that see a chronic shortage of demand, resulting from a savings glut, a failure to invest or a long-term slowdown in the rate of technological progress and innovation. Others see sluggish economic activity as stemming more from the balance sheet problems of recent years. Neither theory can claim a monopoly on the evidence, but which one is closer to the truth matters because the possible remedies are different. The traditional demand management policies to deal with a world of “secular stagnation” and persistent deflation may not be effective if the weakness is more a by-product of the financial cycle. On the latter view, activity should pick-up once the headwinds from debt-deleveraging subside, provided that supply-side impediments to growth are addressed. So like Schrödinger’s cat, the global economy appears simultaneously dead and alive, and we may not know which until many years hence. Deciding where the US fi ts into this global story has split opinion too. Depending on where you look, you could be forgiven for thinking that the US was teetering on the edge of another slowdown. Financial markets were volatile in autumn 2015, with stock prices under pressure and demand for risky assets drying up. Business surveys have softened and the US corporate reporting season has provided its share of disappointments. But a strong case can be made for an alternative view that sees the US as being well down the road to repair and able to withstand the headwinds blowing from overseas. Policymakers have been struggling to make sense of the data too. Concerns about developments in emerging markets (especially China) helped to persuade the Fed to hold back from raising interest rates in September 2015, against widespread expectations for the first hike in rates since 2006. Having been the main driver of global growth for over a decade, the Chinese economy is clearly at risk of a harder-than-expected landing, as it makes a tricky transition from state-led investment to a more consumer-led economy. And the outlook for many other emerging markets is also mixed, amid low global commodity prices, weak exports and difficult economic reforms. The possibility of higher interest rates in the US has also been luring capital back to the US, putting pressure on the dollar and crimping demand for US exporters, effectively doing some of the Fed’s work for it. With financial markets having recovered somewhat since September, all eyes are now on the December meeting of the FOMC, which is shaping up to be one of the most pivotal of recent years. A decision to raise interest rates will be seen across the globe as a vote of confidence in the resilience the US recovery: a sign that the strength of demand from American consumers is sufficient to ensure a return of modest inflationary pressure. By contrast, a decision to hold rates steady could imply doubts about whether the above-trend growth of recent years can be maintained, putting further progress toward the Fed’s employment and inflation goals at risk. And if a Fed-hold in December is taken as a sign that interest rates could remain close to zero for a much longer period, debate will intensify about the further options for monetary easing, in the event that a downturn takes hold. Adding to the difficulties in tracking the progress of the US economy this year have been a host of one-off events and temporary distortions to headline output data. Growth at the start of 2015 was depressed by bad weather and the strikes at West Coast ports (real GDP growth came in at a feeble 0.6% annualised). And after a strong rebound in Q2 (3.9%), GDP growth again disappointed in Q3, rising by a below-par 1.5%. But the underlying picture in Q3 was not so gloomy. 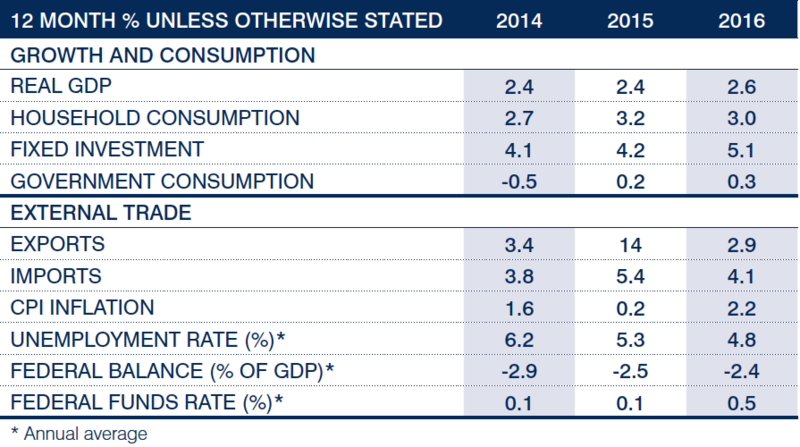 Personal consumption spending increased at a healthy rate (3.2%), as did residential investment (6.1%). This suggests that demand from US households held up well. Business investment was softer (rising 2.1%) and with exports slowing sharply, the contribution of net trade was marginally negative. But the main factor dragging down growth was an inventory correction, which subtracted a substantial 1.4% points from headline growth. Stripping out the impact of net trade and inventories, final domestic sales rose by 2.9%, suggesting little sign of a downturn in underlying demand. Underlying growth at this pace was broadly in line with the average for the last two years and was comfortably above estimates of the US’s potential growth rate over the medium-term (a little below 2%). Our forecast assumes that US growth will continue to clear this (relatively low) bar over the next year or so. Domestic demand is likely to remain on a firm footing as low inflation, rising consumer spending, higher government spending and stronger housing investment compensate for moderate growth in business investment and a continuing drag from net exports. With growth set to remain above trend, the amount of spare capacity in the economy should therefore be reduced gradually (the output gap is currently estimated at around -2.8% of GDP). This would provide justification for the Fed to begin withdrawing the extraordinary monetary stimulus of recent years. Indeed, we expect interest rates to go up from December, but we also see a very gradual path for subsequent hikes, with interest rates unlikely to reach their long-term neutral rate (around 3.5%) until the end of the decade. Many of the recent concerns over growth have focussed on the weakness of the industrial sector, which has contracted steadily throughout 2015, as lower global energy prices have thrown petroleum production into reverse, and softer external demand combined with a stronger dollar caused output growth in the manufacturing sector to stall. By October 2015, for example, the ISM index of manufacturing activity had dropped to 50.1, its lowest level in almost three years (close to the 50 no-change mark). The forward looking orders index offered some reassurance of a slight improvement (52.9), but export orders remained in contractionary territory (47.5). So far, however, there appears to have been a fairly limited spill-over to the services and household sectors. The ISM non-manufacturing index – which covers activity in a range of service sectors, construction, utilities and mining – has softened a little since mid-2015, but rebounded in October to a level consistent with solid growth (59.1). Indices of consumer confidence are generally holding up. And, reflecting a recovery in residential investment, in October the NAHB homebuilder sentiment index hit the highest level since 2005. All of this is reassuring for the outlook. Household demand is providing the main support to the ongoing upswing, with annual growth in real consumer spending averaging 3.3% over the past four quarters. Against a backdrop of robust consumer confidence and low inflation, consumer spending is expected to continue to power the US economy over 2016. The labour market remains a source of strength. True, the growth in non-farm payrolls has slowed as 2015 has progressed, with the three-month moving average sliding from a 15-year high of 324k new jobs per month in December 2014 to 187k by October. But the unemployment rate has still continued to fall over this period, reaching a seven-year low of 5%, only marginally above the level estimated by the Fed to be consistent with full employment (4.9%). With the US economy now operating much closer to its potential, some slowing in the pace jobs growth was to be expected. And looking ahead, jobs growth of around 100k per month (or less) should be enough to push down the unemployment rate further. 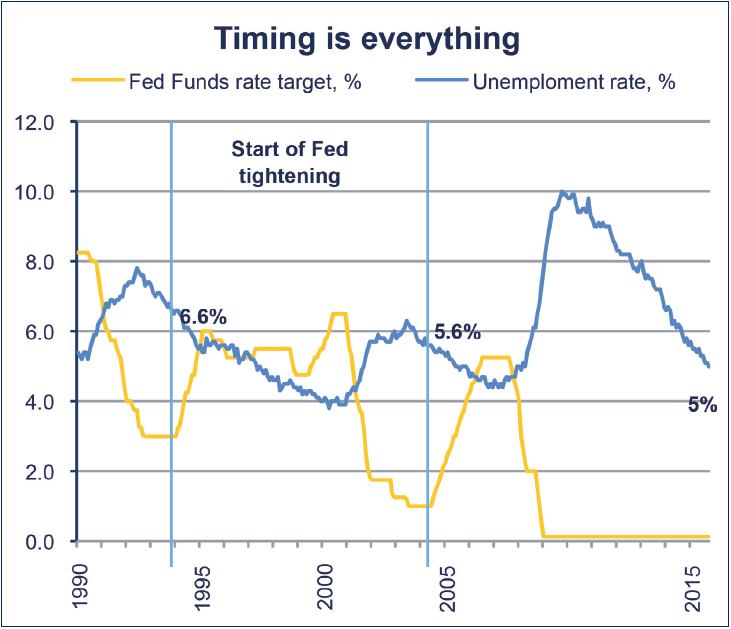 In past economic cycles, the Fed has started raising interest rates well before unemployment reached such a low level. So what is different this time? One factor is concern that some of the fall in unemployment has been due to people withdrawing from the labour market – as evidenced by the fall in the labour participation rate from over 66% before the financial crisis to 62.4% today. According to the Council of Economic Advisors, around half of this decline can be explained by early retirements among the baby-boomer generation and cyclical effects, a good chunk, however, remains unexplained. The risk over the medium-term is that a large number potential US workers are either unwilling or unable to seek work (possible explanations include low wages, high transport costs or a lack of affordable childcare). Another puzzle, given the fall in employment, has been why wage growth has remained so subdued, having been stable around 2% for much of the past five years, despite the broader improvement in the labour market during this time. Although wage growth finally showed signs of moving higher in October, jumping to 2.5%, this remains far below rates above 3% typically seen when the economy has achieved full employment. This has led to some scepticism over whether the “Phillips Curve” – the long-run relationship between unemployment and wage or price inflation – provides any grounds for expecting inflationary pressure to rise over the near-term. However, recent research from Goldman Sachs using localised data illustrates that the relationship still holds true, with states and cities with low unemployment generally seeing the fastest wage growth. Looking ahead, therefore, there are still good reasons to expect a further pick-up in wage growth as the labour market tightens. Stronger income growth will be crucial to sustaining demand over the next couple of years, particularly as the household savings ratio has drifted down during 2015. Household purchasing power will receive continued support from low inflation in the near-term: the Fed’s preferred inflation measure (PCE) has hovered just above zero through 2015 (standing at just 0.2% in September), with core PCE inflation steady at 1.3%. With faltering Chinese demand causing a renewed slide in prices for oil and other commodities, and the dollar appreciating again, inflationary pressures are likely to remain low for a while yet, but the impact of past falls will begin to unwind in the coming months, and strengthening activity and base effects will push inflation back towards 2% during 2016. In the absence of stronger wage growth, purchasing power will be squeezed. A stronger recovery in wages should also feed through to residential investment. Housing market activity disappointed in 2014, but has strengthened during 2015. The Fed’s Senior Loan Officer Opinion Survey for Q3 2015 pointed to a sixth consecutive quarterly easing of mortgage lending standards. Rising household incomes, combined with low interest rates and moderate house price inflation, should help ease affordability constraints, and further reduce risk aversion among lenders. This should allow activity to rise more in line with underlying demand than has been the case in recent years (as implied by demographic trends). Encouragingly, household formation has picked up during 2015, rising above its long-run rate. An improving economy should encourage more young people to leave home, buy (and furnish) their own apartments and houses in the years ahead. The outlook for business investment is more mixed. Declines in oil drilling activity (around 11% of total business investment) have weighed heavily on business investment, with annual growth over the last four quarters slowing to 3.8% from 5.8% a year earlier. Spending on structures has been particularly hard hit, with growth practically stalling over the past year (0.8%), while equipment spending has also slowed (3.4%). The only component showing stronger growth over the past year is investment in intellectual property products (6.6%). The shake-out in the US energy sector still has some way to go. The number of US oil rigs fell by more than half over the year to October 2015, hitting its lowest level for five years. With oil prices expected to remain close to $50 per barrel through the first half of 2016, the sector is likely to remain a drag on growth in the near-term. But the medium-term picture remains brighter. The U.S. Energy Information Agency predicts that production will continue to fall further through the middle of next year – due to “unattractive economic returns” – but the decline is coming from a strong base, with expected total US oil production of 9.3m barrels per day in 2015, nearly double the amount pumped as recently as 2008 and the highest level since 1972. Moreover, while normal oil production has a steep supply curve (with high fixed investment costs, long lead times, and low decline rates if price falls) shale is the opposite. Short lead times, low investment costs and the relative ease with which extraction can be paused means that US shale producers can quickly ramp up production should prices begin to rally meaningfully higher. Outside the oil sector, US firms should be able to count on sustained growth in consumer demand, but a number of factors suggest business investment growth will remain moderate. High frequency indicators, such as durable goods orders and investment intentions, have generally softened over the past year. And though profit margins remain high, overseas earnings have taken a hit from the stronger dollar and an emerging market slowdown. The impact of these trends varies across firms and sectors. Overall, US firms get around one third of their revenues from overseas, but less than 10% of foreign sales come from emerging markets, according to recent research from HSBC. The sectors most exposed to weaker emerging market demand include information technology, materials, energy and industrials, whereas sectors such as healthcare, financial services, utilities and telecommunications are more heavily focussed on the domestic market. Another factor that could weigh on business investment is the health of corporate balance sheets. With the Fed having kept its benchmark interest rate at near-zero for the last seven years, US firms have loaded up on debt, with non-financial corporate debt rising to 44% of GDP by mid-2015, within spitting distance of the pre-financial crisis peak of 45% in 2009. While firms may have been taking advantage of low interest rates to refinance more expensive debt, their ability to service this debt (as measured by interest coverage ratios) is nonetheless at its lowest since 2009, according to data compiled by Bloomberg. This raises some questions about how companies will cope if, or rather when, borrowing costs begin to rise. The Fed’s latest Senior Loan Officer Survey suggests that credit standards on commercial and industrial loans tightened over Q3 for the first time since early 2012. High debt loads could prove to be a significant drag on the economy if earnings growth slows further and investors cut back on corporate lending. On balance, the US economy seems in reasonable shape. An improving labour market and a pick-up in wage growth are expected to support consumer spending, which should encourage businesses to maintain investment spending. The main weak spot is net trade, which has already subtracted about 0.7 percentage points from GDP growth over the last year. This reflects a combination of the slowdown in China and other emerging markets, a hesitant recovery in the euro zone, as well as the appreciation of the dollar’s external value by 16% since mid-2014 (on a trade-weighted basis). Given our assumption that the Fed will raise interest from late-2015, and that the ECB is likely to scale up QE to counter economic weakness and deflationary pressures in the euro zone, policy divergence is likely to put further upward pressure on the dollar further in the year ahead. With relatively strong domestic activity expected to continue pulling in imports, the drag from net exports is likely to increase therefore. The most significant risk to this outlook is the prospect of even weaker global conditions, and that this deals a more serious blow to confidence in the US. In particular, the extent of the slowdown in China remains a key unknown. Although the direct impact is likely to be fairly limited – exports to China account for 7% of US exports, or around 1% of its GDP – the impact could be magnified given the importance of Chinese demand to other emerging markets, as well as by the potential for capital flight to push up the dollar further. These factors could ultimately offset any benefit to US consumers and businesses from continued low prices for oil and other commodities. And if the divergence in economic prospects and policy looks like persisting, the Fed could respond by pausing the process of monetary policy normalisation. It may even have to reverse course. We may find we need to deal with the prospect that Schrödinger’s cat is dead, after all. The CBI (The Confederation of British Industry) provides a voice for businesspeople and their businesses on a national and international level. We speak for more than 240,000 companies of every size, including many in the FTSE 100 and FTSE 350, midcaps, SMEs, micro businesses, private and family owned businesses, start-ups and trade associations in every sector. Our mission is to promote the conditions in which businesses of all sizes and sectors in the UK can compete and prosper for the benefit of all. To achieve this, we campaign in the UK, the EU and internationally for a competitive policy landscape.